With help from Chelsea Clinton and Jimmy Kimmel, ServiceNation is launching a new initiative with plans to inspire millions of young Americans to pursue a year of service through national programs such as AmeriCorps and City Year. The public service announcement on Serveayear.org states, “The goal of the campaign is simple but ambitious: to make a service year after high school or college the expectation, not the exception.” On Monday, Chelsea Clinton and Jimmy Kimmel unveiled the new “Serve A Year” initiative in front of a crowd of 200 Hollywood executives. Following this announcement, Chelsea Clinton appeared on the Jimmy Kimmel Live show to speak on the initiative and raise awareness. 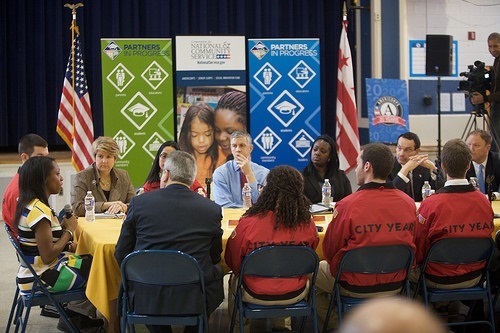 NPQ covered ServiceNation’s partnership with AmeriCorps in 2013 to work toward popularizing a year of service. Since then, ServiceNation has worked with Hollywood executives in the entertainment industry to integrate national service storylines into popular shows such as Parks and Recreation, House of Cards, and True Detective. “Serve a Year” will continue to promote their message through popular television, as well as collaborating with YouTube and FunnyOrDie to expand their reach to a younger, digital audience.